We live in a world where aluminum abounds, and we never really give it much thought. Aluminum is used in everything from foil to pots and pans, soda cans, and more, known for being an affordable and durable material. Aluminum wiring has even been used in homes. Most residential electrical wiring is copper today, but that wasn’t always the case. With a spike in the cost of copper between 1965 and 1975, many electricians turned to aluminum wiring in their projects. This is said to have affected nearly two million American homes during this time period. In time, it was discovered that less isn’t always more; even though it’s cheaper, aluminum can’t compare to the long-lasting durability of copper wiring. 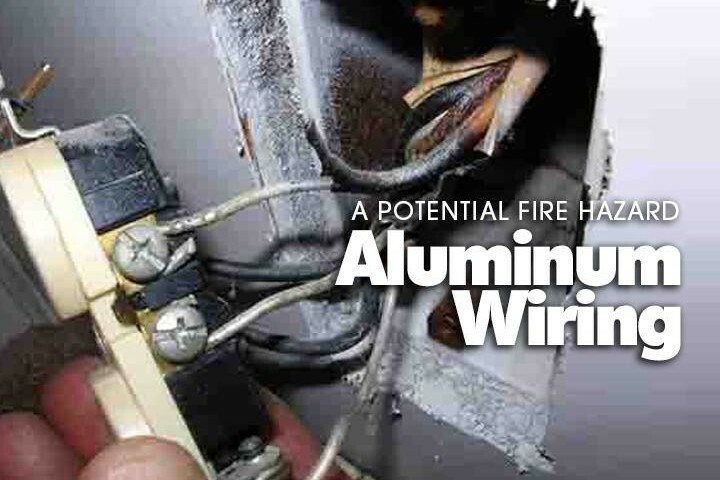 Degradation and poor connections over time lead to fire hazards so significant that many home insurers refuse to cover homes that contain aluminum wiring. Aluminum isn’t as strong of a conductor as copper. This creates more electrical resistance, causes the wires to break down, and creates dangerous amounts of excessive heat. Further, aluminum is more prone to vibration, which loosens electrical connections over time to create a fire hazard. With staggering evidence like this, aluminum wiring was generally phased out altogether. Rest assured, it is considered unlikely that you would have aluminum wiring in your home today. But how can you really tell? For one, consider whether your home was built or renovated between 1965 and 1975. It’s a good idea to have a local electrician perform a thorough check of your wiring. Aluminum wiring can be easily identified visually — aluminum is shiny silver, where copper is not. The word “aluminum” or initials “AL” will appear on the wire jacket. Your licensed electrician can spot aluminum wiring, check connection points, and make an assessment on its condition. They can make the updates necessary to bring you up to electrical standards and the comfort level of your home insurer.